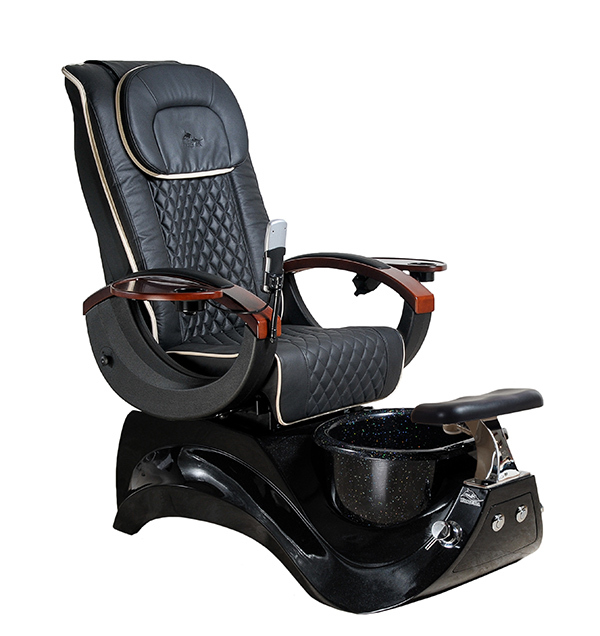 The Alden features several important benefits for spa owners that make this one of our best-selling pedicure chairs. The Alden includes a dual-function spray hose that can also double as a spout for true flexibility in filling and cleaning pedicure basins. The sloping front of the chair allows easy access to the client but also protects the technician's back from strain. The remote-controlled full function commercial grade massage offers knead, tap and roll functions and can be adjusted to the client's preferences. Part of Valentino Beauty Pure / Whale Spa's high end line of chairs, the Alden is a beautiful choice and a good investment. As with all Valentino Beauty Pure / Whale Spa chairs, this one is engineered for maximum space efficiency and is guaranteed to withstand the hardest use. Beautiful simulated leather covering, stone composite basin, real wood arms and a choice of khaki, cappuccino or chocolate colors make the Alden a perennial favorite. All Valentino Beauty Pure / Whale Spa Pedicure Chairs are UL listed.